Love is in the air and Valentine's Day is just around the corner. Here are some easy ideas to have a festive Valentine's Day with your little loved one. LOVE NOTES: A love note in the lunch box from mommy or daddy is much appreciated anytime but around Valentine's Day toddlers especially love a "valentine". Over the years I've noticed that it doesn't really matter whether it's store bought or homemade, it's the fact that it's special that seems to excite your child. "My daddy gave me a valentine!" Chloe squealed as she kissed her card. GIVING: During our classroom Valentine's Day party we sit in a circle and take turns passing valentines to one another. The children love to be both the giver and receiver of valentines. They often hug each other, thank each other and have a great time. Lessons like taking turns, saying please and thank you, and caring for others are all learned without missing a beat. Take a few minutes out of your day or evening to have a Valentine's Day party at home. Exchange valentines after a family dinner. Or make valentines together and deliver them as a family to Grandparents or close friends. It doesn't have to be elaborate or expensive. The point is to have family time, make memories, start traditions and show kindness to one another. BAKE TOGETHER: If you've never baked with your toddler Valentine's Day is a great time to start. Recipes are great for reading and following directions. You'll introduce math through measurements. It's an opportunity to teach your child about kitchen safety and patience. Kids love to stir, pour, and help. Muffins or cookies that you bake with real, quality ingredients are going to be healthier than most processed store bought treats. And toddlers are especially proud to show off the cookies they made with mommy. FUN LUNCHES: Cookie cutters work great for sandwiches too! My students become excited when mommy or daddy has used a cookie cutter to make their turkey cheese sandwich in the shape of something different. Susie would much rather eat a "heart" than a plain old sandwich. 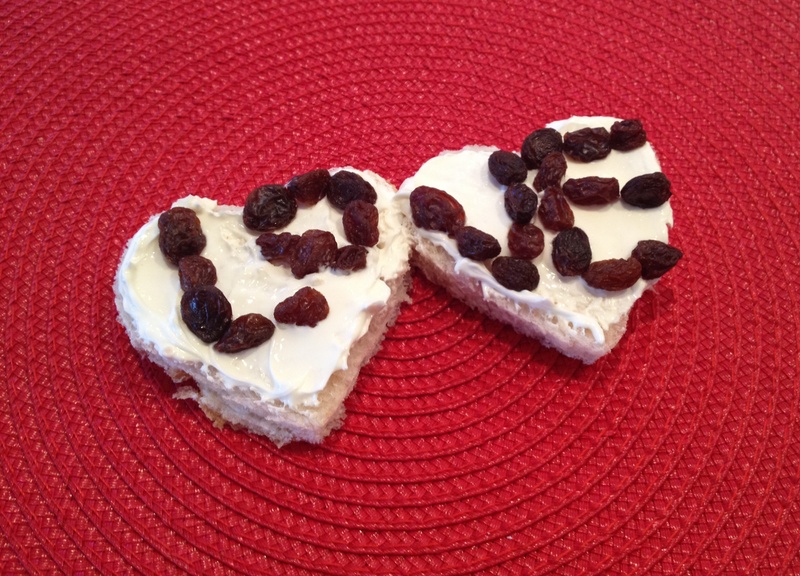 Placing raisins or banana slices on an open faced peanut butter sandwich in the shape of a heart, or "I love you" is quick and easy. Strawberries are a sweet treat perfect for Valentine's Day. They are red; heart shaped and taste great plain or dipped in a Greek yogurt. And green veggies in a special "valentine" container your child decorated magically become more desirable. FANCY PACKING: Valentine lunch bags can be as simple as a brown bag that you decorate together the night before. Toddlers enjoy creating their own lunch bags with stickers, markers and having their names in big letters all over the bag. Spending time with your children, having fun together and creating wonderful Valentine memories …. Now that's amour!